Apologia Educational Ministries is a trusted homeschool company with excellent products. We have used their various curriculum for years and are always blessed by their determination to explore God in all things educational. What better than to try the The Ultimate Homeschool Planner - Orange Cover planning system. 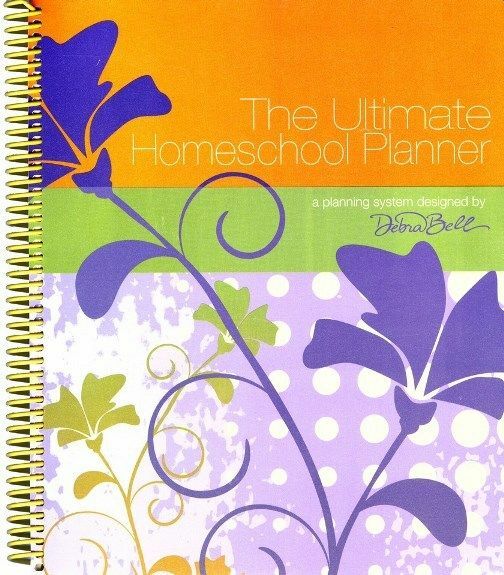 The creator of outstanding homeschooling materials seems to be a great fit for planning an ultimate planner! This planner gives you several pages of 'user guide' for ease in planning and even includes suggested days and amounts of time for planning. It is also very encouraging about your call to homeschool. Pre planning is something I typically lack in. I get gung ho in the summer to plan for the first month or so of school, but after that I tend to get too busy to keep the pre planning going. "Order brings peace", is a traditional saying from St. Augustine. Planning helps ease some of the chaos in homeschooling and allows students to become more independent learners. Debra Bell and Zan Tyler have designed this planner with the homeschool mom in mind. "We want you to do more than just survive your call to homeschool; we want you to thrive in the pleasure of God's calling on your life". We are in the 2nd quarter of school now. I haven't had a yearly planning retreat, EVER. Which this planner suggests. Maybe that would be a good idea at least at the semester end, to evaluate where we are and where we need to go for the rest of the year. I have heard of many who do a yearly retreat for planning and they are really refreshed. There are pages for setting student goals, a one year planning grid for days off, holidays, and special events. There are monthly and weekly planners. One thing I love is that they are not labeled!!! You can start this planner at any time, rather than feeling like half of the year is gone, and you wasted the first half of the book. Not with this planner! You start on page 26 with the monthly planner and jump in right where we are.. November (if you were to get yours soon!). The grid is very flexible without having dates or topics. You can choose to put the day of the week, or the subject. You can utilize what ever works better for you and the amount of children you are working with. I preferred to put the name of the child on the left column and the subject on the top. We can then see what all they have for the entire week of assignments. There are 6 tabs on each on the vertical and the horizontal. I just started the top with Monday and was able to include Saturday as well. The monthly pages are all together, then start the weekly. I would personally have liked to see one monthly page, and then 4 weeks of weekly so that I can easily flip back and forth between the monthly layout and the week we are on. I simply put a paper clip to mark my monthly page to make it a bit easier to locate quickly. With so many helps and guides, this is much more than just a planner. The back of the planner even has teaching tips, learning styles, reluctant learners, and raising an independent learner. Along with the weekly planner there is also 2 pages to record prayer requests, Bible plan, memorable moments, evidence of grace that God has shown you. This planner becomes much more a part of history in the making, and recording your family as it makes that history. You will keep these forever, storing up the memories for your children to share down the road. I like that is it much more personable, than a mere planner. See what my Crew Mates thought of the Ultimate Homeschool Planner by clicking on the banner below.